sandwich toaster recipes collection. Sandwiches are quick and easy to make. In spite of having a handful of ingredients, you can whip up delicious, filling sandwiches in times of hunger. You can make an old-school sandwich with simple ingredients or loaded sandwiches with exotic ingredients. From chutneys, sauces and cheese you can enhance the flavor by the addition of any of these. Out of all the variants available cold sandwich, stuffed, layered, grilled or toasted, toast sandwiches are my favorite! Toasting brings out the sugariness of the bread. You can either toast a bread in a pop-up toaster and then stuff with a mixture and serve. Bread slices can even be toasted in an oven, applied with a stuffing and baked further. A hand toaster which you can directly place on the gas stove will help you make quick toast sandwiches. You can even make sandwiches on a tava, it is very easy to do and fuss-free. The sandwich is a popular roadside food in Mumbai. From a basic chutney sandwich to vegetable cheese grilled sandwich, you will find huge varieties of sandwiches with a combination of various ingredients. The Masala Toast with a flavorful potato stuffing, veggies and chutney are easy to make. When cooked on a sandwich toaster, the aroma is so appetizing that one just cannot resist a bite! If you are not a fan of potato stuffing, opt for the veg toast sandwich, which is neatly cut into six equal pieces and served with tomato ketchup and chutney. Cheese Chilli Toast made by stuffing chutney coated bread with a mixture of crunchy capsicum, cheese and seasoning. The gooey cheese will perk up your mood the moment you have the first bite. The subtle flavor of mushroom combined beautifully with Indian spices makes Mushroom On Toast an amazing mid-day snack. You can mix together boiled corn with finely chopped vegetables and herbs to make a Garlicky Corn, Tomato and Cheese Toast. A very simple Tomato and Cucumber Open Sandwich with tongue-tickling green chutney have to be consumed immediately after cooking before it gets soft and chewy. Crisp, buttered toasts topped with a lip-smacking combination of cheese, olives and jalapeno to make the Cheese, Olive and Jalapeno Toast are sure to make you drool! If you do not have a sandwich maker, worry not! You can make those crusty toasted sandwiches at home now by roasting it on a tava. Just smear some butter on a hot tava and make delicious Cheese Vegetable Sandwich, Potato and Corn Sandwich or Cabbage and Carrot Double Decker Sandwich. Also, you can make healthy Oats Moong Toast. 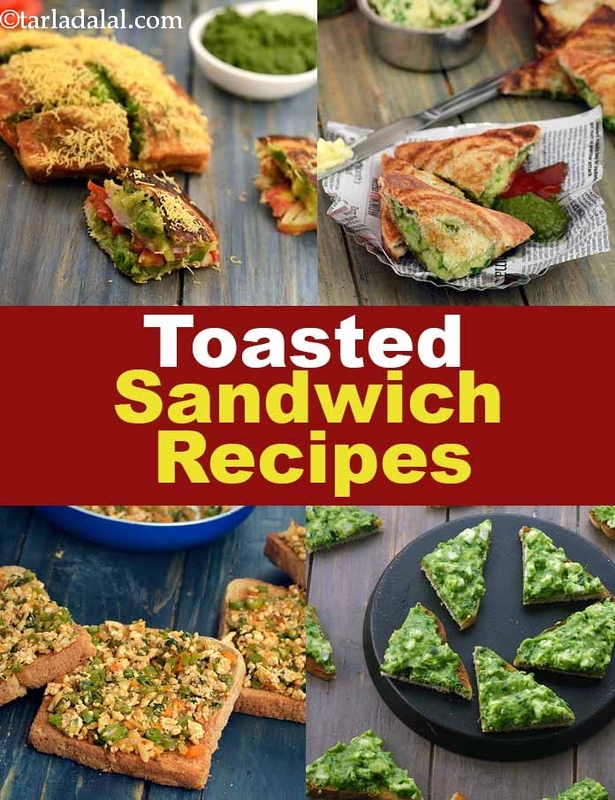 Enjoy our sandwich toaster recipes collection and other starter, snack recipe articles below. Paneer and cheese perk up the protein quotient of this toasted vegetable sandwich. Packed with bone-strengthening calcium, this is also a great option for children. Enjoy it with a glass of fresh juice to kick start the day! Combining the moist, subtle flavour of mushrooms with the tang of garlic and capsicum…. Make a light meal out of it, a snack, or simply an appetizer.